Play Stay and Dine…and Save up to $600 at the Walt Disney World® Resorts: Here is a great offer for your next family vacation. For most stays from January 5th through March 5th, 2014 when booked by December 31st, 2013 you can save $600.00 (based on a family of four) on a five night stay at selected Disney Resort hotels with the Play Stay and Dine promotion. Take advantage of some huge saving by booking now. Save Up To 35% on Stays at Select Walt Disney World® Resort Hotels: If you are planning a Winter-Spring vacation in 2014, now is the time to book. You can save up to 35% off select Disney Resorts from January 5-April 12, 2014. These savings are based on availability. This sale ends December 31, so book today! Florida Resident Fall & Winter Rates: Florida Residents can take advantage of great rates on rooms at select Disney Resorts hotels for stays through December 14, just in time for the holiday season. Florida Resident Savings this Winter & Spring on Select Walt Disney World® Resort Hotels: It’s the perfect time to enjoy a magical getaway. 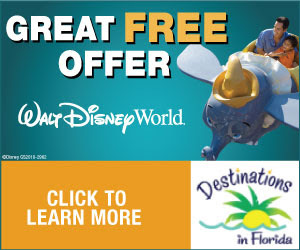 Florida Residents can enjoy even more magic with great rates at select Disney Resort hotels most nights January 4- April 8, 2014. For example, save up to 37% on rooms at select Disney Deluxe Resorts and Disney Deluxe Villa Resorts from January 4- January 18 and March 14- March 29, 2014. Book December 2, 2013 - April 8, 2014. Military Discount: Active duty and retired members of the US military can get specially discounted rooms at Disney Resort most nights through September 27th, 2014. Thank you for serving our country. Intro to Disney: For first time guests or guests looking to save money, the Intro to Disney package is perfect. This package includes at least a 3-Night package with your Disney Resort, 2-Day tickets, and the Quick Service Dining Plan. You can add additional nights and days at the parks, for an extra cost. This price starts from $999 plus tax for a family of 3. This price is subject to change based on availability. This discount is available for most visits from January 5-February 12, 2014. Hurry, this discount ends on December 31, 2013. Save Up to 25% on Rooms at a Disneyland® Resort Hotel: Save up to 25% on rooms at a Disneyland Hotel most Sunday through Thursday nights from January 5th through April 10, 2014. Book through January 28, 2014. Two Disney Vacations in One for Less than $800: Combine the magic of a cruise and all of the wonder of Disney World into one amazing deal! Packages are a 3 night’s stay at a value resort plus a 3 night cruise. Sailings are from January 17, 2014 through February 7, 2014. Book now to be part of this great adventure. Special Rates for Cruises from Port Canaveral: You can escape on your own carefree, tropical getaway with Disney Cruise Line® and save 20% off prevailing rates on select 3- and 4-Night Bahamian Cruises sailing from Port Canaveral in January 2014. All voyages include a visit to Nassau and an unforgettable day at Disney's private island paradise, Disney’s Castaway Cay, with its sparkling turquoise waters and white-sand beaches. Available sail dates: 3-Night Bahamian Sailings on the Disney Magic®: January 10 and January 31, 2014 and 4-Night Bahamian Sailings on the Disney Dream®: January 12 and January 26, 2014. Special Castaway Club Member Offer: Castaway Club Members can receive a US $100 onboard credit when they book a 4- or 5-night Disney Magic® cruise departing from Miami from December 15 - December 18, 2013. You can use your credit for a variety of onboard activities and experiences, including spa treatments, shopping, adults-only dining and more. Canadian Resident Offer: Canadian residents save 20% off prevailing rates on 3 and 4 night Bahamian sailings aboard the Disney Magic® for most sailings from January 10 – February 28, 2014 (excluding January 17, 20, February 14, 17, 2014) for categories 4A – 11B. Get a Free Night and Free Breakfast: For a limited time, when you purchase a minimum 4-night stay at Aulani, A Disney Resort & Spa, you’ll get the 4th night free - including breakfast daily for two adults at the new Ulu Cafe. Book this offer by January 15, 2014, for stays most nights January 5 – April 7, 2014. Save up to 30% on Universal Resorts: Discounts begin at 3 nights at any of the three Universal Orlando® Resort deluxe hotels during the best days to vacation. Plus take advantage of $150 in hotel savings including discounts on food, drinks, spa treatments and more! Vacation dates include: December 15-December 19th, 2013. Save up to 25% at Cabana Bay Beach Resort: Discounts begin at 4 nights at Universal’s Cabana Bay Beach Resort, opening early 2014. Travel back to the 1950’s and 60’s for endless family fun at Universal’s Cabana Bay Beach Resort. With its ideal location and fun retro atmosphere. It’s the perfect spot to enjoy everything Universal Orlando® Resort has to offer. The value and moderate accommodations feature family suites (sleeping up to 6) with kitchenettes, and standard rooms (sleeping up to 4). Rates valid for travel September 1st, 2014 through October 2nd, 2014 and November 30th, 2014 through December 11th, 2014. Universal’s Cabana Bay Beach Resort: This new resort is opening in early 2014 with an incredible preview discount. This resort is inspired by iconic beach resorts of the 1950’s and 60’s. For a limited time, the whole family can experience Cabana Bay Beach Resort's new family suites with rates starting at $104 per night for a seven-night stay to $134 per night for a three-night stay. Offering up to 47% savings off regular prices, this introductory offer is available now for purchase for stays from March 31 to June 14, 2014. Package is available for purchase now through January 31, 2014. Universal 1-Day or 2-Day Pass with Shuttle Transportation: Take a day away from the Disney World Parks to visit the Wizarding World of Harry Potter! Book a 1-Day or 2-Day Pass to Universal Studios with shuttle transportation included in the ticket. This special ticket is only available with select companies including Destinations in Florida. Expedition Antarctica at SeaWorld®: Experience the Freeze! Package includes free Quick Queue (front-of-the-line) at SeaWorld’s Antarctica: Empire of the Penguin™, dining at the Expedition Café, a free photo and a third hotel night FREE! SeaWorld + Aquatica Add Aquatica for just $40: Enjoy unlimited access to the sights and splashes of SeaWorld Orlando and Aquatica, SeaWorld's Waterpark™ during your vacation. Free Food: Book your Sea World Package at a partner hotel and get the All Day Dining for FREE. Add a day at Aquatica and eat there free, too! Kids Free, PLUS 2nd Visit Free, through December 25th, 2014: SeaWorld is the place for families this holiday season. And now, enjoy one free kid’s admission (ages 3-9) with each full-paid adult admission ticket. Save $10 on Sea World Tickets: Pre-order your Sea World tickets and save $10 off per ticket. You can also print your Sea World tickets, so you do not have to wait in any lines once you arrive to the park. Plus, even better, your 2nd day at Sea World is free! 5 Incredible Parks, 1 Ticket, Orlando’s Best Vacation Value: See more for less! This package features the Orlando FlexTicket, offering unlimited admissions to SeaWorld, Aquatica, Universal Orlando, Islands of Adventure and Wet’n Wild during your stay. Perfect for your Orlando vacation. Stay at least 5 nights and enjoy the best of Orlando! Plus, free transportation and other great benefits available when you choose an Official Hotel of SeaWorld. Package requires a 10-day advance purchase. Stay a minimum of 5 nights and as an added value, your 5th night is FREE!